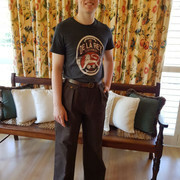 Got my chinos back from the tailor for shortening the legs a bit. T-shirt is from another brand I'm fond of. The bench in the background is also vintage in a traditional Boer style, with seats of rawhide thonging. Email: Send Edouard an email. Private Message: Send Edouard a private message.